Even when our whole world seems to bespinning out of control, we can restsecure in the promise that God is alwaystaking care of His loved ones.Scripture verses carefully arranged intorelevant themes provide assurance and peacestraight from the heart of God. Inspirationalquotes offer additional reminders that God splans are for our good. Even if we havemoments when we lose our control we cantrust that He never does.Packed with faith, promises, wisdom, andblessings, our pocket-size books have all thebeauty and quality customers have come toexpect from Summerside Press . Thisirresistible line of value-priced Gift Booksoffers lavish, upscale packaging, with strikingdesign and pearlescent paper, to complementthe powerful message of each book. - Publisher Even when our whole world seems to be spinning out of control, we can rest secure in the promise that God is always taking care of His loved ones. Scripture verses carefully arranged into relevant themes provide assurance and peace straight from the heart of God. Inspirational quotes offer additional reminders that God’s plans are for our good. Even if we have moments when we lose our control—we can trust that He never does. Packed with faith, promises, wisdom, and blessings, our pocket-size books have all the beauty and quality customers have come to expect from Summerside Press™. This irresistible line of value-priced Gift Books offers lavish, upscale packaging, with striking design and pearlescent paper, to complement the powerful message of each book. 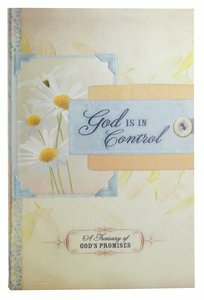 About "God is in Control (Pocket Inspirations Series)"
Even when our whole world seems to be spinning out of control, we can rest secure in the promise that God is always taking care of His loved ones. Scripture verses carefully arranged into relevant themes provide assurance and peace straight from the heart of God. Inspirational quotes offer additional reminders that God’s plans are for our good. Even if we have moments when we lose our control—we can trust that He never does. Packed with faith, promises, wisdom, and blessings, our pocket-size books have all the beauty and quality customers have come to expect from Summerside Press™. This irresistible line of value-priced Gift Books offers lavish, upscale packaging, with striking design and pearlescent paper, to complement the powerful message of each book.